An organization seeks to display 3D imagery on a video wall that is generated by a dedicated real-time rendering computer. Collaborative functionality is required to visualize additional data on the video wall from sources such as computer desktops and video conferencing streams. The VuWall controller is being set up to capture all outputs from the computer rendering farm, along with the other required inputs (i.e. camera & computers). Office applications, PDF files and webpages are then set up locally from the controller and then positioned on the video wall. 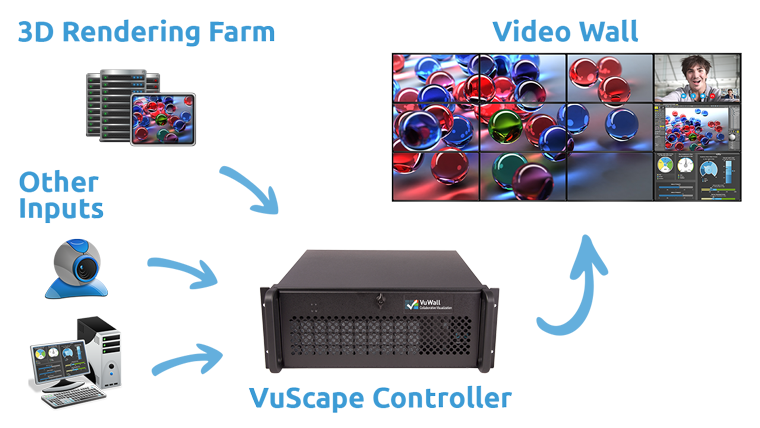 Maximum performance of the 3D rendering is ensured by the VuWall controller which is non-intrusive to the rendering farm. The visual interface of the controller allows for easy manipulation of the 3D imagery along with the other inputs captured to be grouped and positioned on the video wall as if it was a single source.